Here’s the latest update to my Top 20 Blue Jays Prospects list. I tend to emphasize results at higher levels of the minor leagues over tools, so some players that might be ranked higher on other lists may be lower here. Original ranking is in brackets. 1. SP Aaron Sanchez – Dunedin (1) – Sanchez has been pretty dominant this season and has done nothing to diminish his number 1 ranking. 2. SP Roberto Osuna – Lansing (2) – Osuna looks like an ace pitching against older competition in the Midwest League. 3. SP Marcus Stroman (3) – Stroman has made four starts so far and has looked good by all accounts. 4. SP Sean Nolin – New Hampshire (8) – Made a start in Toronto and has been impressive in AA. 5. OF Kevin Pillar – New Hampshire (4) – Pillar’s strong start to the year gets him a big bump in the list, and quite high up too. While he lacks the upside of some of the younger guys, he looks real good and should probably end up in the majors somewhere. 6. 3B Andy Burns – Dunedin (6) – The first of the previously unranked position players who have burst on to the scene. I’ve been told by people in Dunedin that he’s been pasting the ball and playing great defense. 7. SP Daniel Norris – Lansing (10) – Norris has really picked up steam in May, putting up some big strikeout totals while bringing walks and runs down. Walk numbers can still improve, but he’s finally realizing some of his massive potential. 8. RP John Stilson – Buffalo – (11) – Stilson has been really good in AAA in relief since coming off the DL. He’s not higher despite being so close to the majors because the Jays have decided to keep him in a relief role. 9. SP Matt Smoral (5) – I’ve heard great things about Smoral from scouts. Haven’t seen him pitch myself though. He might start moving back up if he starts out strong in short season ball this month. 10. 2B Christian Lopes – Lansing (11) – Lopes is having a good season so far in Lansing, but hasn’t really been developing his eye or his power. 11. 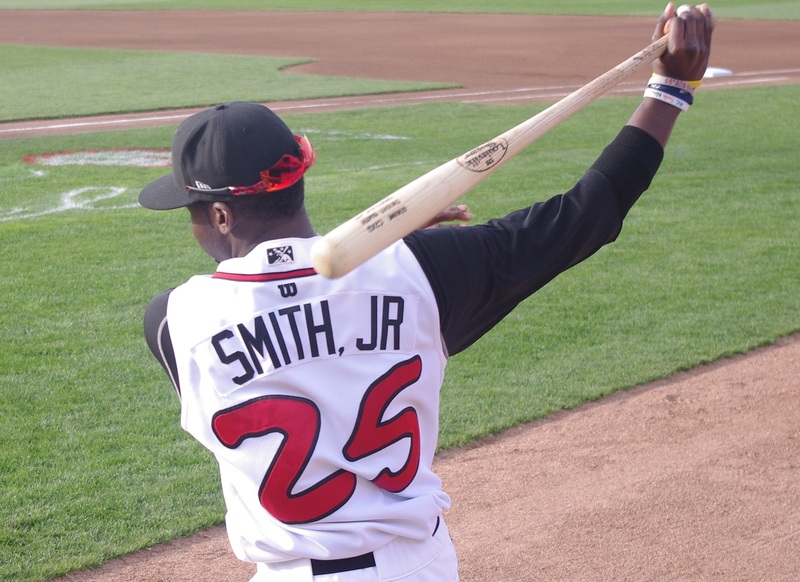 OF Dwight Smith, Jr. – Lansing (nr) – Smith has been impressing people (including me) in his stint in full-season baseball that started at the end of April. He’s making lots of contact, not striking out excessively, getting on base, and stealing at a high success rate. 12. OF D.J. Davis (7) – Davis hasn’t played, but the reports from scouts have been that he’s still very raw and needs a lot of work at the plate. 13. C A.J. Jimenez – Dunedin (9) – Returned from the DL briefly but is back on it now. 14. OF Dalton Pompey – Lansing (12) – Pompey has slumped in May and has struck out a lot. He still posts great stolen base percentages and is only 20 years old. He still has time. 15. C Santiago Nessy – Lansing (14) – Nessy drops due to some poor defense and a weak start to the year with the bat. Hopefully, when he gets off the DL, he’ll be able to start turning things around. 16. P Alberto Tirado (16) – Heard good things, but he’ll probably start in Vancouver. Jesse Goldberg-Strassler reports great things from the Crosstown Showdown in Lansing. 17. P Adonys Cardona (15) – He’ll probably start in Bluefield or Vancouver. He made an appearance at the Crosstown Showdown yesterday in Lansing. 18. 1B K.C. Hobson – Dunedin (nr) – Hobson makes it back to the list because he’s hitting the ball hard in Dunedin and actually leads the team with 8 HRs despite missing the beginning of the season due to an injury. His average needs to come up but he’s definitely continuing the improved power display he showed last year in Lansing. 19. P Chase DeJong (17) – Another HS age pitcher who will start in short season ball but impressed in the Crosstown Showdown in Lansing. 20. P Jesse Hernandez – Dunedin (18) – Hernandez is having a very good start to the sesaon in Dunedin. He’s 22 and was just named to the Florida State League All-Star team.